England is a constituent country of the United Kingdom of Great Britain and Northern Ireland. The country covers an area of 130,395 km² and its population compromises of 50.76 million people. The official language is English. 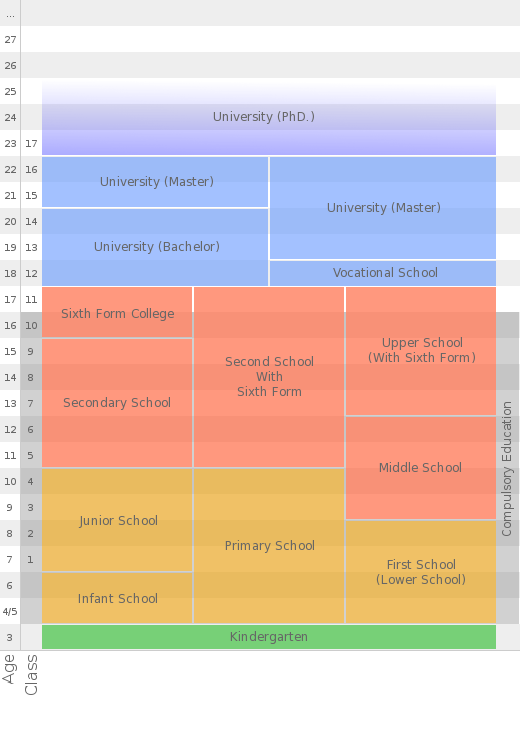 There are many types of schools, usually defined by who employs the staff, who controls admissions and who owns the land and the buildings: Community schools, Foundation schools, Voluntary-aided, Voluntary-controlled, Academies, City technology colleges, Specialist schools, Grammar schools, Faith schools, Special needs schools, Pupil referral units, Independent schools and some school with alternative methods. Education is compulsory from the age of 5 to 16 years. It's free of charge. There are nationwide tests at the age of 7, 11, 14 , 16 (General Certificate of Education) and 18 (A/A2 Levels). It's free of charge. Independent school offers alternatives, International Baccalaureate or International GCSEs. Homeschooling is legal and parents don't have to have educational background. Kindergartens are not compulsory. Children have to be 3 years old to attend, for younger there is a possibility of other day care. There are maintained (58%), private (37%) and independent (3%) kindergartens, most of them on a part-time basis. Maintained are fully governmental funded, private and independent can get a partly government coverage but parents have to pay too. Many children attend Reception Class from the age of 4, which are run by the Primary schools. Undergraduate study is state financed, but student fees have recently sharply increased. There is considerable disappointment about this amongst students and teachers. As the Special Educational Needs and Disability Act 2001 asserts the right of children with physical or behavioural problems to be taught with mainstream classes, more and more children with special needs are taught in mainstream schools, and specialized schools for disabled are being closed. From September 2008 a new policy (EYFS) in childcare, i.e. pre-primary education, should be implemented.